SNIP: Polar bears are typically born on land but live mostly on sea ice, where they hunt and feed on seals. 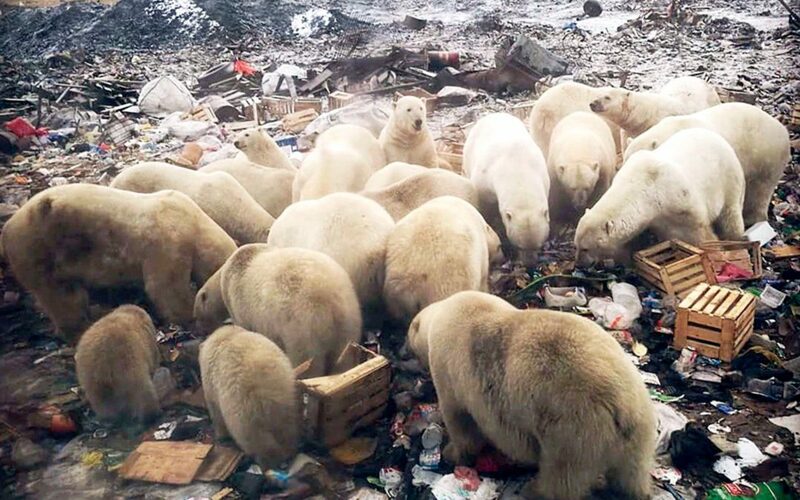 But as Arctic ice thins, an occurrence linked to the acceleration of climate change, the animals move ashore, ravenous. They scavenge, sometimes coming into contact with human populations. Novaya Zemlya is a Russian archipelago stretching into the Arctic Ocean. Officials in the Arkhangelsk region, where the archipelago lies, declared a state of emergency Saturday because of the marauding mammals. At least 52 bears were massed near Belushya Guba, the main settlement on the island territory. The polar bears are battling adverse conditions of their own, driven by changing conditions in the Arctic, which is warming more than twice as fast as the rest of the planet.